Spring is in the air and the promise of summer is around the corner. This month we have included some topical articles on the current state of the property market and the declining wine industry. Please also take a few moments to read about our exciting new development at the Chateau les Carrasses. It will come as no surprise to say that the current property market is slow in the Languedoc-Roussillon. However, it is not seeing the same downturn as other areas. In the USA, the UK and Spain, as the economic situation has declined, many borrowers have defaulted on their mortgages and consequently a large number of properties are forced sales, with properties being offered for sale at vastly reduced prices. There is a large increase in the supply of property at the same time as a decline in demand due to the economic issues and this imbalance of supply and demand has compounded the large drop in property prices. The French property market has not suffered from the above issues and therefore has not seen a large increase in property supply, but it is, however, affected by a substantial decrease in demand. Although the decline in foreign purchases has only a limited effect on the overall market, it has a disproportionate effect on certain types of properties where the foreign buyer makes up a substantial segment. 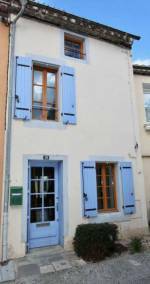 These include traditional French character properties and properties in areas particularly favoured by foreign buyers. Consequently, the significant reduction in foreign clients has contributed to these types of properties falling more than the market average (in some cases, drops of 20% versus the market average decline of 2.5%). Notaires and FNAIM (France's national association of estate agents) do not believe there is the prospect of a market crash and forecast that, on average, prices will simply stagnate and that the current situation is a 'correction' of a previously over priced market. Substantial house price increases have been going on since 1998, with peak increases of 7.2-15.5% registered between 2004 and 2006. The housing market is now obviously experiencing a significant slowdown, levelling out to a rise of only 3% during 2007. Historically, France has had relatively stable prices. In any given year property may increase or decrease by a small amount, but traditionally prices have remained broadly in line with inflation over both the medium and long term. From 1998 to 2006 there was a change from this traditional pattern but the French property market has now returned to its normal behaviour. Another factor influencing the property market is the currency market which is creating a bit of uncertainty. There are those who are choosing to wait and see what happens, particularly with Sterling, and those who are actively looking and negotiating very good deals. The weakening pound against the euro not only makes property seem more expensive, but those who are dependent on a UK income find that the currency rate changes make the cost of living in France much higher than a year ago. Those who need to sell their UK property to fund the purchase of a property in France, are finding the drop in UK property prices means they have less money to spend. Having said all that, the Languedoc-Roussillon is still a highly desirable area. It is less expensive than neighbouring Provence and the Côte d'Azur, not overcrowded, it has beautiful untouched countryside, long sandy beaches and offers a more authentic 'south of France' feel. It continues to provide the right mix of investment potential and lifestyle choice and remains one of France's most popular tourist destinations - even experiencing an economic boom in certain local industries. It is very much a buyers' market and people are taking their time to find the right property for them. Although there are fewer of them, they tend to be serious buyers who find themselves offered a wide choice where prices are reduced or very negotiable. The UK exchange rate with the euro has definitely had an effect on British buyers but those who have euros in their pockets to spend are taking advantage of buying bricks and mortar as opposed to taking their chances in the volatile money markets. France is also a safer investment than other foreign property markets with its long standing tried and tested market without the various risks that some of the emerging markets offer. The overall French property market should continue to be relatively stable and things are likely to continue along a similar vein for the foreseeable future. Overall, it is likely there will be small declines over the next two years. However, in property segments where foreign buyers have a significant influence, prices will remain very depressed until the international economic situation improves. In the next few weeks, AB Real Estate will launch the Chateau les Carrasses - a very exciting new development by Domaine & Demeure, set to be the most interesting development launched in the Languedoc this year. Just outside the village of Capestang, the Château is an exceptional 19th century wine Domaine that enjoys a superb elevated site overlooking the Canal du Midi between Béziers, Carcassonne and Narbonne. This is the quintessential South of France - rolling hills fringed with Cypress, ancient forests of oak and chestnut, and the famous vineyards and olive groves that carpet the landscape from the hills down to the shores of the Mediterranean. The development will consist of just 27 properties each fashioned from the existing buildings on the estate by renowned architect Francois Thoulouze. Amongst a host of great communal facilities including swimming pool and tennis courts, the cave - abandoned some twenty years - will be fully refurbished and will once more operate as a working winery producing quality boutique wines which will be marketed internationally through select channels. All owners will benefit from a share of the annual yield - estimated at around 50 cases per year. 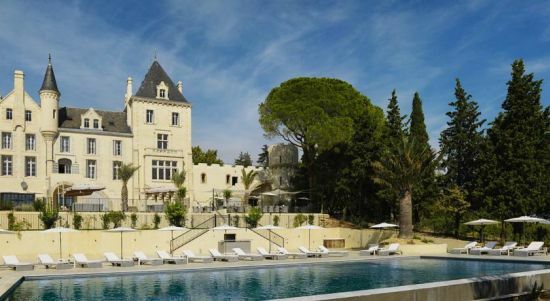 Prices at the Chateau will be from around €195,000 for a one bedroom apartment in the Chateau to €650,000 for a large house with private pool in the converted winery building. AB real estate is very excited to be involved in this fantastic development. For further details please contact us (see below for contact details). Spring is traditionally a good time to sell a property - the season often being launched here in the Launguedoc-Roussillon by the arrival of Easter. Now more than ever you need to make every effort to present your property in the best possible light if you want to sell it. Addicts of make-over programmes will be able to tell you the number one rule; de-clutter ! By all means leave some character in the property and, after all, you are still living in it, but be ruthless about all those nik-naks, ornaments and general clutter that have inched their way into your life over time. Secondly, make good any damage or unfinished DIY jobs as nothing puts a buyer off more than worry about the soundness of the property. Best not to plant any seeds of doubt. Thirdly, make sure the house and garden is clean and tidy. Make the beds, put clothes away and do the dishes. It may sound obvious, but first impressions are lasting. Fourthly, leave the 'selling' to your estate agent who knows the clients and your property and will put over all the positive aspects of your house. Ensure that you are asking a realistic price for the property that reflects the current market. Finally, offer the buyers a drink and use of your 'facilities'. Often clients have been out and about for a good chunk of the day viewing several properties and such an offer will be gratefully received. It will also help to provide a good positive image of, not only the property, but of you as someone they may be dealing closely with in the future should they buy your property. We have in previous issues told you about our Support and Services company which is expanding quickly beyond our initial expectations. We provide a full suite of property management and personal administration services to ensure you get the most out of your time and your property in France. We will take the hassle out of managing a property in a foreign country so that you can relax and enjoy your surroundings, free from the mundane tasks that can eat up so much of your valuable leisure time. Our dedicated, multilingual team (all major European and Scandinavian languages spoken) is experienced in all aspects of managing a property in a foreign country. We bring this experience to bear to provide a top quality service, tailored to your exact needs. We provide a high quality, professional service. No matter what the task, we organise and oversee everything on your behalf, acting with the utmost discretion using a network of pre-screened, qualified service providers, each of whom is registered and insured. You tell us what you need, and then sit back, awaiting confirmation that the task has been completed to your exact specification. We can provide you with assistance to handle everything from translations, to opening a bank account, to project managing renovations to, well, any need you may have - whatever it may be. Contact us for an informal discussion to see how we can assist you. For serious buyers we have several properties for sale at the moment that really are going for a bargain price, so if you are thinking of investing in this area, please don't hesitate to give us a call. Don't forget Spring is a good time to put your house on the market if you are thinking of selling - and if you would like any advice again, please contact us. Thanks once again for taking the time to read our newsletter and as always I hope you found it interesting.